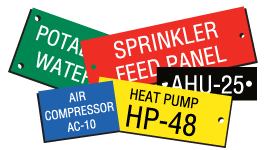 Engraved Plastic Nameplates are manufactured from low glare, scratch resistant, satin finish plastic and are offered in multiple mounting options. Text is permanently engraved into the surface. Out of the three options, plastic nameplates are the most economical choice. 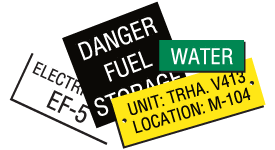 They are not recommended for outdoor use; however, they are perfect for indoor machine nameplates. 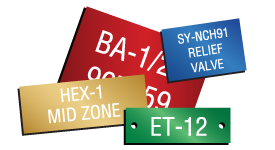 Engraved Phenolic Nameplates are made with a rigid thermoset material that is electrically non-conductive, low glare, scratch resistant. Phenolic nameplates are offered in multiple mounting options and feature text that is permanently engraved into the surface of the material. They are not recommended for outdoor use; however, their build makes them the perfect choice for indoor electrical equipment nameplates. Laser Etched Anodized Aluminum Nameplates are manufactured from 1/32" thick aluminum with a matte finished coating in clear or color. This coating provide a neat, sharp contrast of wording against the colored background, resists further oxidation, and makes it more suitable for outdoor usage. A two-sided laser etched option is also available for purchase.